The main reason I bought this software was to fix this issue however when trying to stream in full screen, it just doesn't work. I selected the process for the game and it still says no game detected. Some games won't work with full screen game capture, have you tried window capture or display capture? also here, won't work with full screen, but works when game is running in window mode. Please fix. We really need more info to work with other than "It won't work with full screen". Windows Store Games will not capture plain and simple. This affects all streaming software. Currently, anything using battle-eye anti-cheat protection will not capture either, but that should change very soon. Some Games just will not capture unless using Monitor or Window capture. They lock it out. We can only really cross out the battle-eye scenario, the others are just the nature of game hooking and all game hooking software is subject to those limitations. We will be happy to look into it if you provide us with some more info! Sometimes changing the Game Capture setup from a specific process to any full screen application will resolve the issue. any advice for a v3.0 user still running into this issue? You are experiencing an issue capturing a fullscreen game with the "capture any fullscreen game" box checked, while using the Game Capture method? Do you experience the "No Game Feed Detected" message? What game is it that you are trying to capture? A work around to capture a full screen game would be to use the monitor capture option, and crop out any information from the shot that you do not want visible. still nothing on this subject? monday I will request a refund. I bought the software and I still use Xsplit and now testing Bebo. Gameshow wants to go pro, but it fails miserable. So: BIG, BIG problems regarding game capture. Forza 7 for which I bought it, It didn't work until now. No method, window, monitor, etc. Also today I wanted to stream some music and the webcam, so nothing to complicated. Guess what? For Gameshow was very twisted apparently. One hour without sound, nothing. I have a pretty nice audio setup and still this application of yours is failing to capture any audio today. Let's see tomorrow, maybe the there will be better days for this joke application. Actually I will refund it now, why to leave for tomorrow something that will not work neither after tomorrow. :) So, good by telestream, it was an awful experience!!! DON'T BUY BEFORE YOU REALLY TEST THE S**T OUT OF IT! 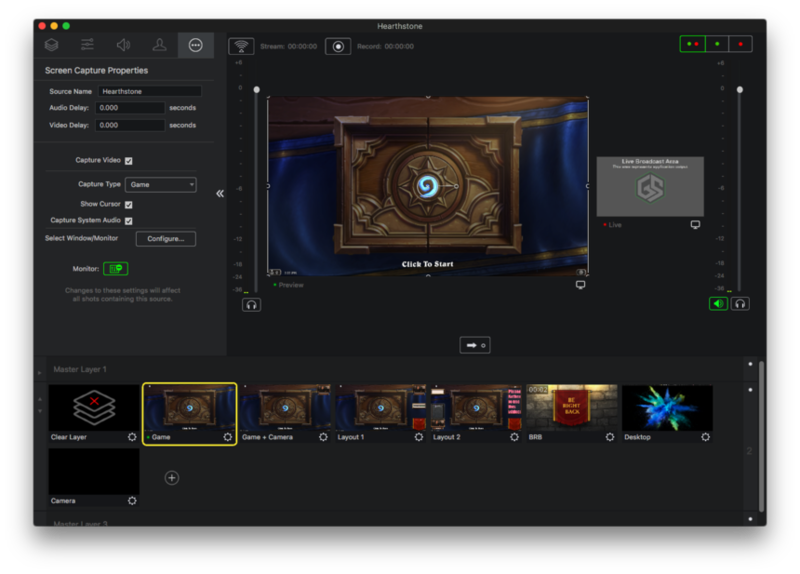 Maik Lohse Test to make sure it isn't specific to Hearthstone since different games may have different impact on GPU use which can impact GameShow game capture. Working for me on Mac with two monitor setup. Hearthstone on one monitor, GameShow on the other. Which may indicate OS/GPU relationship issue.